Script: Client Server Test for Universal-Robots via TCP Socket Connection. UR Script programming – Test for Receiving coordinates from Host. 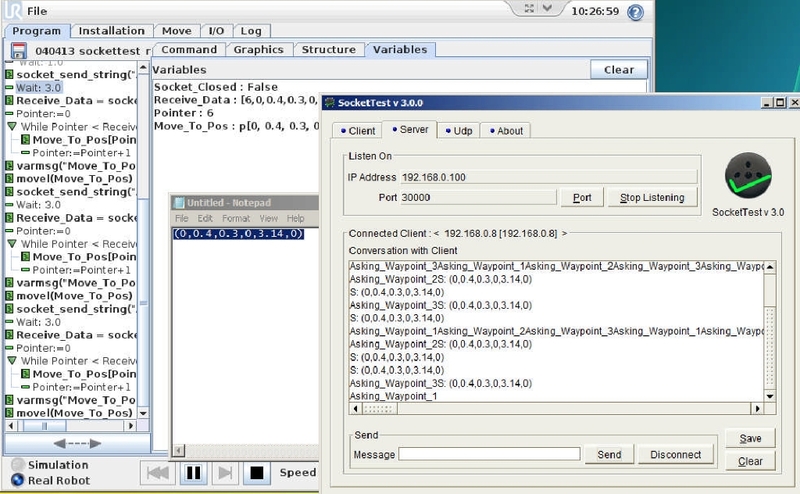 The example show the UR robot with a running program and the UR robot initiate a socket connection to a Host – in this case a PC. The IP address of the PC is 192.168.0.100 and port 30000 is used in this examples. The IP address of the UR is 192.168.0.9 and port 30000 is used in this examples. Client program running on UR Robot. On the PC Side (i.e. 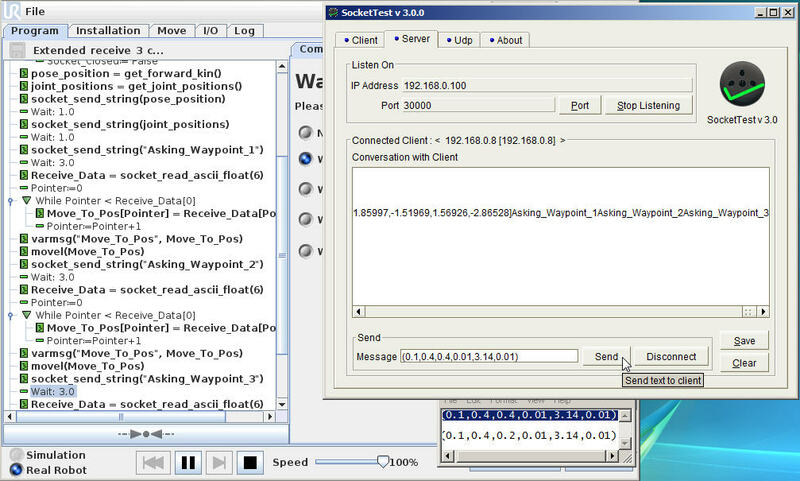 Host or Server) is in this case running Socket test program just for testing the Socket purpose, but later a C program that can serve the UR robot is shown. I have a client-server program working with universal ur3. the network, I am now connected directly to the robot via an internet cable. Should I be using a special cable for this? Re-configure the robot’s ip address? I got problem when comparing the string when I send a string from pc(server side) to ur(client side). Maybe consider to receive as byte instead “socket_read_byte()” and then make the compare on byte level. 2.Can I change the values of a predefined TCP? I would like to test a part connection’s compliance, by modifying the connection point with a certain value (+-1.5 mm, 2 deg, etc). Therefore I wanted to have a random value that would offset the TCP data on a certain axis before moving in for the connection, and having the original TCP back afterwards. Since I want as many different positions, switching between different TCP sith the SET function would not really do. For your first question I think I need to give a similar answer like last time. There is no command to make a polyscope program a server – and rightly so because the robot is already busy controlling a 6 axis robot arm and many inputs and outputs and monitoring many safety functions. So to use a specific machine such as a robot also to be a server is not ideal. Maybe the prossecor load a server generate – can be considdered to be on a external device that communicate with the robot client. And then there is the MODBUS port 502 described here. I am not sure I understand your question correct, but maybe you can consider to use planes – and the do pose_trans with the desired plane as reference. I have here a problem to sending files from the UR Robot to an Ubuntu Unit. Reason is, that i want control an Robothand from righthand-robots that works with Ubuntu and python-orders. My thoughts are now, that i write .txt commandfiles with the script order of the UR10 techingpendant an send it vi socket to the ubuntu unit. On interface i can see, that the txt. files are saved in /programs. But when i look over a terminal to search them on the flashdrive i cannot find them. I´m a complete Newby in programming with the UR10. Next problem is, that the hand is no plag&play. Runs only over a separaty Ubuntu-Unit with python orders. When a program is made in Polyscope GUI then the program is sored as a x.urp file along with a x.script and x.txt file. All three of these files are stored in the same directory as the program has been stored from the /programs directory and downwards if there has been created directories. If the program was stored on a USB drive the files are stored in /programs/usbdisk/ and downwards. I’m newbie with UR, maybe this is a wrong section for my question, but here I can explain my problem. The code you list is from a .script file that the robot create automatically when making programs in the Polyscope GUI. Therefore it is wrapped in code from the GUI enviorment especially the “set_….” shown before $0 and also the comments shown in the lines with $. This wrapped code should therefore not be included if you want to reinseret into the GUI enviorment because then it will be double entry of some of the code. The .script file is shown there because it is very informative and a good place to look for how script commands look like for learning purpose. Also the “while True:” is already there behind when programming from the GUI because the GUI enviorment is for making programs and in this example the “Program loops forever” is ticked inside the GUI and therefore it will be double and incorrect to insert “While true:” one more time. The code you show is from a program written in GUI and therefore it cannot directly be inserted in the GUI again. This is really bad news for me, because my partner wants from me a very complex program (running 24/7), with a hundreds of positions and routes and I have not weeks but few days to be ready. I thought somehow possible write program using text editor. What do mean by a complex program and running 24/7 ? There are programs made in GUI or made by text editor that can run 24/7. Yes you can make programs in text editor – did you click on the link ? What is your idea of having hundreds of positions and routes made in a text editor ? You can have a long list of positions and routes in a text file. However I find it easier and faster to make programs in GUI which are also more friendly to maintain and modify. What kind of application are you working on and how are the hundreds of positions and routes ? Much appreciate for your quick answer. We preparing a project for car industry in enterprise environment where production is 24/7. OK noted – yes in the GUI enviorment you can also very fast and easy copy and paste waypoints or whole sections of program with many waypoints inside. And in the GUI when you program execute the program pointer is shown which makes it friendly to maintain. If you program with a text editor there is no program pointer for the line of codes in the text file – so any error there will just to point to one line which is the text file that might have many lines of code – then it becomes difficult to maintain and also difficult to understand for others. We are using socket_send_string to send data off the robot to a cloud storage. This is working very well fo us but we are having an issue. In our case we are monitoring the current being consumed by the device we are operating with the robot. If the current goes above or below certain limits we want to send an additional set of data out of the robot. 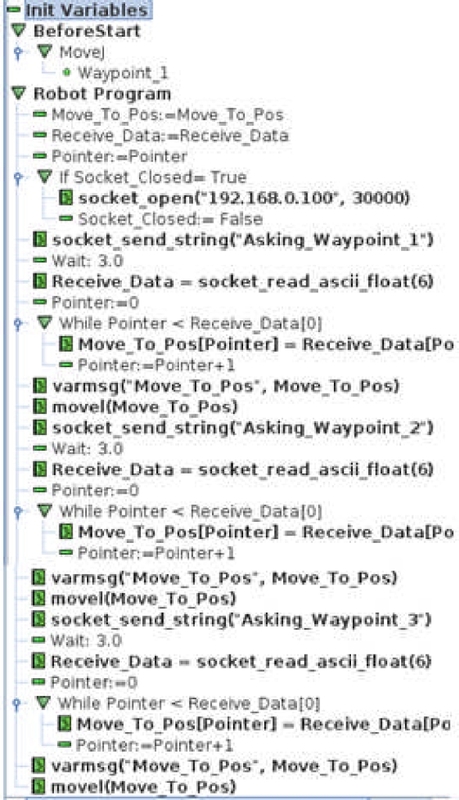 We have placed these additional socket_send_string commands inside of an if control statement. We never get these bits of data. If I put the whole socket series of commands inside of an if statement we also never make the connection. Any ideas what we are doing wrong? Can you show me the code ?